It seems that conference season is upon us – and our Twitter stream will soon be full of weird acronym hashtags all ending in 16! It’s tricky to get the Tweeting balance right when you are at conference, you don’t want to tweet too much for fear of boring your followers but at the same time you want to share the knowledge and atmosphere of the conference. I don’t admit to getting it right all of the time, and sometimes I definitely feel that I have tweeted too much (if you ever feel I do then please just tell me – I promise I wont take offence) However it is important to get the balance right – both for you (as concentrating on tweeting what people are saying for long periods can be exhausting!) and for the people following the conference. I first and foremost tweet for me, I use my tweets to refer to later in my CPD reflections. I have been known to use Storify or Steller to collate the tweets and link them together: If you search for the conference hashtag and your Twitter handle eg “#ConferenceOfTheDecade16 @AgencyNurse” you can easily find just the tweets that you have sent, even months or years after the event! Try to keep it informative, don’t be afraid to ask questions and draw in the people who may be watching on Twitter. 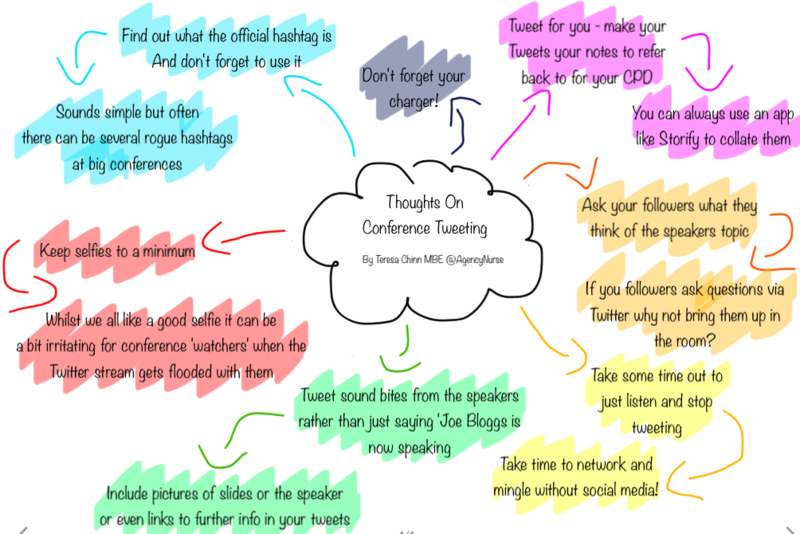 It is great watching a well tweeted conference from afar you can glean so much information however it’s even better when you start to have conversations with conference goers.